An Effort to Save the Endangered One Horned Rhinos from Extinction at Manas National Park, Assam; Travel to Love! It was a rather usual Spring morning at Manas. The Terai jungle, a UNESCO heritage National Park, is getting flooded with sunshine. Towering Shimul trees frolic with their fruits burst out in snow formed seeds and spread the good news to ground, to the mountain springs, to fringe villages nearby Manas National Park. Green pastures are lush with sparse rainfall. Amid this stage, you know a grand celebration is about to take place. Jhumur was playing around with a neon green butterfly while her mother was on the lookout for her favorite aquatic shrub. On a rather hot day, Jhumur loves the dip they take in the pond together. Suddenly she heard the noise of plenty of tier scratches, men and women giggling with the black flashing machine (her mama likes to pose at those black boxes as the humans come visit them early morning, often on top of the elephants). Huffing and puffing, she runs back towards her mother in the water and nudges her gently with the growing horn. “Look, so many of them!” Jhumur’s mother returns a caution stare at her year old daughter and the other side of the fence. In her 30 years of life, she has had myriad experiences with them, the two legged creatures. The plains of Kaziranga gradually faded out from Jhumur’s mother’s memory as she was hauled to the foothill of Manas national Park, the jungle by the Himalayan foothills. She did not come alone. Along came many rhinos from the jungle of Pobitora and more. In her youth, she found a consort from the male who hailed from Pobitora. Together, they celebrated love in the sprawling jungle, now a safe haven for the one horned rhinos as they learnt while growing up. But political stability is akin to oxymoron, hard to achieve; short lived when achieved. Attacks came in again. Jhumur’s mother does not have a fair idea of the price of her horn. It is a big one since she in grown up now. It will fetch them good money, she sighed. She nudged her baby and made a sign to leave the pond. Jhumur listens. They move towards the dense area, away from the humans. The urban people come and go in Manas National Park. It is yet to make a galvanic footprint in the touristy trail of otherwise unexplored North east part of India, much owing to the catastrophic past! The political exploits of center and local tribal people has made the forest see dark days of revolt, spurring plenty of deaths in the wild. At the onset of peace accord, the border area of Manas National Park started to be dotted with a few fringe villages, a few luxury resorts, tea gardens dating back to colonial days, ready to welcome guests. However, the nascent green pasture is a well kept secret from the Himalayan foothills, unlike that of Kaziranga, which reigns on a larger plain by river Bramhaputra in lower Assam, where Rhinos graze by the “aalkhet“. A few right minds from Indian weaver’s association, NGOs(WWF) and administration took active interest in arranging for an alternate livelihood for the villagers meanwhile. The Manas Spring Festival was conceived and staged. 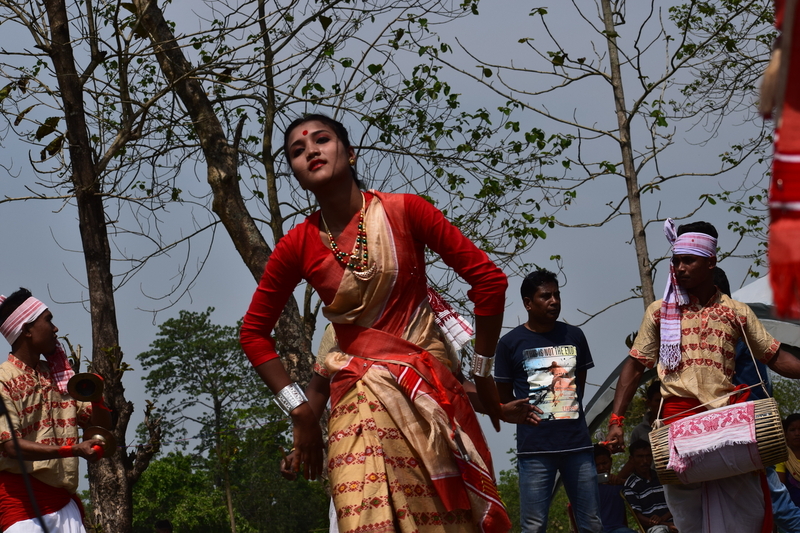 As an invitee I chanced to experience the richness of a rooted culture of the Bodo tribe, the sons of the soil. Reaching Manas National Park, after a bumpy drive for a couple of hours from Guwahati center is more like slipping from the honking howling mayhem of 21th century modern India. You will move to greener pastures, carpets of tea garden will soothe your eyes, the receding smoke of urban air will make space in your lungs and you will breathe fresh, feel a little more lively. March end is Spring in Indian calendar, not in real life. Manas National Park is bordered with electrocuted fencing. I learn the rhinos at times find a way to duck that(!) and come for a little stroll in the residential space. If you find yourself in front of a full grown animal, I suggest run. A dodge with that coveted horn(which is wrongly believed to revive a man’s dying youth or cube cancer for some Vietnamese political figure) shall take a meek human life at ease. On the other side of fencing, stands tall the cute cottages and other accommodation arrangements. We crossed them all and went farther to find out campsite. Oh, I almost forgot to mention! En route, I spotted a mother daughter rhino duo immersed in a shallow water body. The car’s groaning engine had irked them and they took immediate leave, leaving few traces of bubble in the water behind. PS: If a rhino causes you death, your family will get a grant of 3 Lakh INR. The campsite was in close proximity to the crystal clear waters of the Beki river. In the jungle runs river Manas, wild and unbridled. I gaped looking at the jungle where the elusive predator tiger prowls, prehistoric greater one-horned rhinoceroses and snow leopards co exist with countless species of birds. The idea of such a back drop for my bedroom tonight! I could hardly resist the call of wild and wanted to step in the Jungle immediately but an ethereal tune of a flute caught my senses. 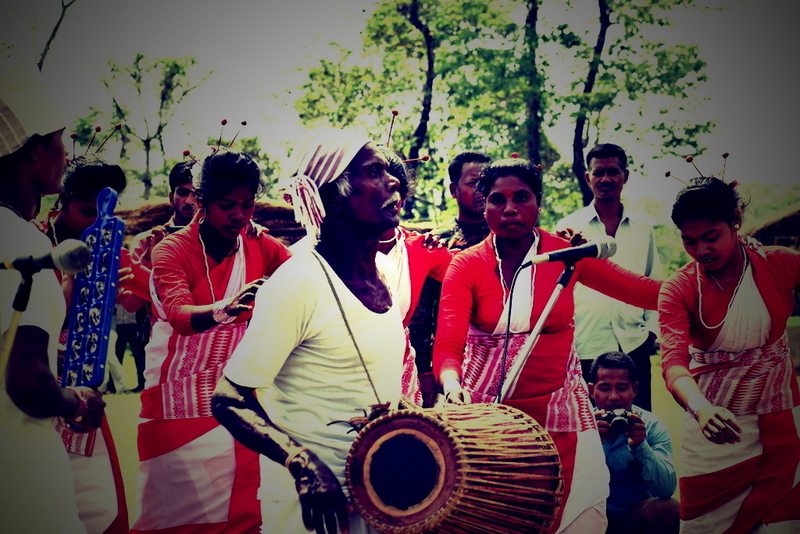 The Bodo villagers had made massive arrangements and showcased the finery of culture through music, food, fabric. Nature played perfect backdrop to the extravaganza. Around 60 villages are situated near the jungle perimeter. They are well equipped with schools, hospitals (and a college)! I spoke with one of the girls from the group of Jhumur dance. Jhumur is a form of folk dance, tracing back its origin in the days of colonial tea garden masters bringing a group of laborers from other Indian states. If you listen carefully, the lyrical details of the music tells how they are urging each other to finish work faster, ‘managerbabu’ will come coercing otherwise. Spring in Assam is not complete without Bihu. And it is the time of Rangali Bihu. Girls clad in ghee colored Mekhla, dotted in bright red motifs, adorned with white Gajras and red bindi will sing and transform into bird-women, in front of you! The men with drums, dhulia, will tune in and bring the best of pain and happiness in the performance. Soon after Bihu, the tune of Bagurumba starts to play and young girls, as colorful as wild butterflies, join hand in hand and offer worship to the supreme god, Bathou. This folk dance form is the traditional way of celebrating plantation and showing gratitude for a good yield. Nature, solemn nature, is present in superlative in local lifestyle. Rice wine and plenty of Pork Khorika: Bodo Cuisine is the reason I shall go back to Manas again! Throughout North east India, gourmet scene is best enjoyed when you get a chance to sit amid the traditional arrangement and taste them with the locals. Sip on the rice wine, Zou Mai, and talk about the empty meagerness of life with members of the Swankar Mithinga Onsai Afat, an association of reformed poachers in Manas who are now engaged in protecting forest and its resources. Culinary art of the land deserves a separate blog post in its own merit. 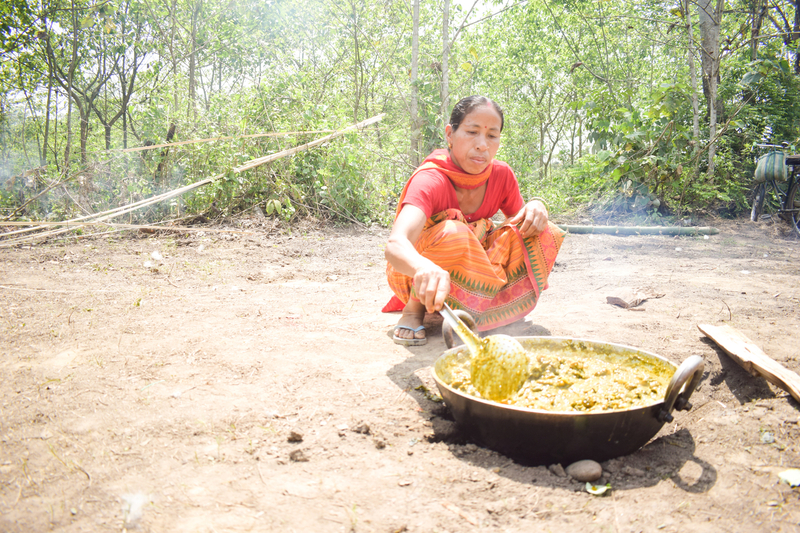 It was astounding to find how the hard working Bodo women have maneuvered nature’s offering and managed to create a huge spread, delicious to say the least! It is cooked with passion and love, hence the end product exceeds expectation more often that not! Pork, locally known as Oma Bedor is enjoyed as grilled, cooked with bitter herbs, mixed with spicy chilies and raw brunoise onion. I was elated to find Shutki (dried fish) which was cooked with green leafy vegetables. A complete Thali shall not cost you more than INR 200 ($3) and trust you me, that is a huge win! I had been advised not to step out of the campsite as the sun started to take a leave for the day. It is not possible to come visit Manas and not step into the vast jungle that shares a significant amount of land with Bhutan. We learn an early morning safari has been arranged for the next day, where the ranger shall venture into the dense forest which he knows by heart, like a lover’s lip. The ranger had been a poacher in past. When asked about how he likes the rhinos, he smiles and says, “For evil to prevail, it only needs good men to do nothing.” Manas National Park has been accredited with the status of UNESCO Natural World Herutage Site for its outstanding universal value. You need to step into the forest to understand the reason! 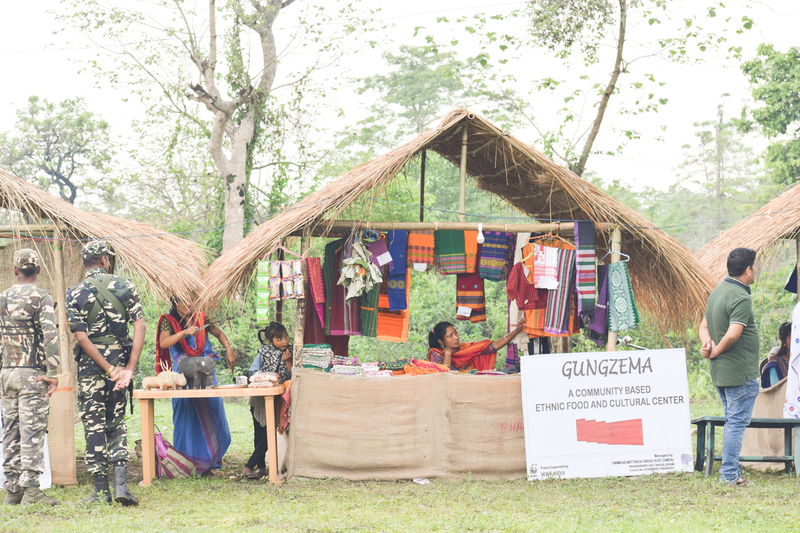 The idea of culinary tourism and giving back to the ethnic community in the process at the Manas National Park is a brain child of Mitali, the blogger behind FoodSutra and Pushpanjalee Das Gupta (read her blog here). To equip the local tribe with the nuances of service attitude, they have conducted several workshops, trained them on the techniques and the ways to deal with guests. Nonetheless, throughout the event I felt a rustic charm wrapping the venue, pure and genteel in nature, reassuring too. The Spring Festival or similar events may not happen on a regular basis, but do not let that belittle your traveling spirit. 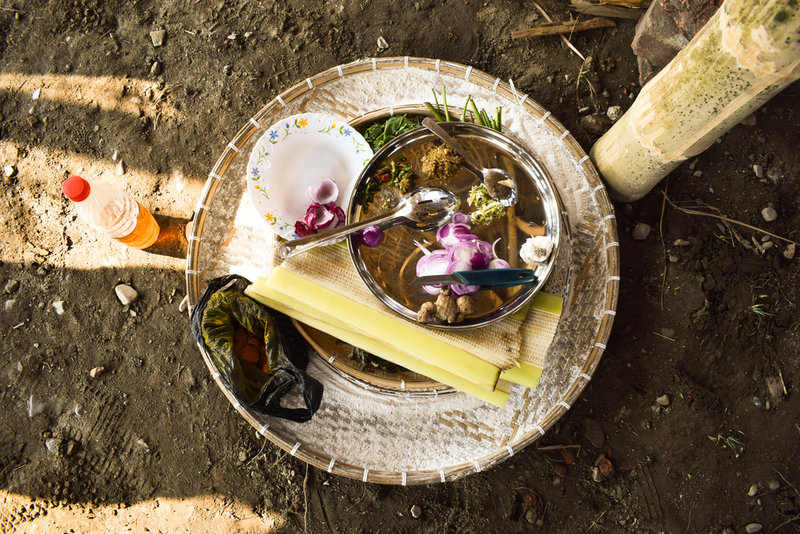 A simple phone call to the village SPOC can help you savor the amazing delicacies the Bodo people eat. Indulge in a few pieces of bright hued Dokona with Araniya. Local women weave then with unadulterated love for days. A Dokona takes around a week to be made and serves as a fine attire once you put the bindi on your forehead! Tourism at Manas National Park is a coveted experience. How to reach Manas National Park: Reach Guwahati and hire a cab. That is the easiest way to visit Manas National Park. Guwahati is also the nearest international airport. Fancy a ride with Indian railway? Come to Barpeta station, 44 KM ahead of Guwahati. Take a taxi ride from there. Where to stay: There are plenty of places to stay in Manas National Park. The best one, IMO, is the Mathangudi lodge which is situated right at the heart of the jungle. It is a government operated accommodation, hence needed to be booked in advanced. When I said advanced, I meant a few months prior, at least, if you are not an Indian who is reading this post! remember we are a country of billion people! Alternatively, you may choose Smiling Tuskers Camp. There is no home stay as of now, but talks are in progress. Camp Buffalo is situated right by the Beki rivers and even though the rooms are styled after camp-stay, you get reasonable comfort with personal attached washroom and dedicated service. Security: Armed Security Guards were present all throughout the event and their presence in the area is frequent, I learn. Be careful to step outside the camp at dusk or night. Tourism at Manas National Park should be conducted in a responsible way and kindly be respectful to the locals. Great Post. Love the integration of insta, videos, photos and text. I haven’t been to India yet and Manas will definitely be on my list. So impressed by your photos! This is something I really want to experience! Amazing photos. What an interesting place and what beautiful animals. What a beautiful and colorful place. I love seeing the animals and hate that they are so much in danger. The festival looks like fun! I’d love to visit Manas! Such a cool story. Really enjoyed your post. Just love all the multimedia integration. Amazing wildlife and delicious food? Sounds like such a wonderful place to visit! Great post and fantastic photos! And thank you for your comment on my Female Travel Bloggers post. Your photos are amazing and really showcase the park and the people in a beautiful light! Am an ex-colleague of Sayantan. All the best to you guys for the blog. Please keep showering poetry and nature in our lives, like you did with this post, else we would all dry away.